Yesterday we had the great pleasure of playing a gig at Walsall’s New Art Gallery. The Silver Thread Tapestry Project was launching its tour, and Walsall Council’s Creative Development Team were celebrating over 25 years of service as their work finally comes to a conclusion. Noddy Holder was there! We played to Noddy Holder. Well, kind of. This entry was posted in Dischord and tagged Andrew, Andy, band, Barbara Nice, Blues, Dischord, drummer, drums, evening, gig, improv, live, music, New Art Gallery, Noddy Holder, performance, Richard, Walsall, Walsall Council on January 21, 2017 by Andrew Clayton. Three years ago, we were established by means of Facebook. Andy and Andrew got talking, and in the following hours the band became a reality. And since then we’ve done almost nothing to promote ourselves seriously, but have enjoyed a number of gigs which were seriously good fun. And long may that continue. This entry was posted in Uncategorized and tagged Andrew, Andy, birthday, Blues, Dischord, Facebook, gig, jamming, music, Walsall on September 20, 2016 by Andrew Clayton. We’ve been offered a gig tonight at Walsall Town Festival, organised by the lovely Deb Slade, the Town Centre management and Jimm Rennie whose one man show “The Ancient and Inaccurate History of Walsall” was premiered yesterday in a caravan parked outside the new Primark. We’re on between half five and half eight at The Bakehouse on Goodall Street. All are welcome. More details about the festival and fringe (of which our gig is a part, shared wtih Elmore Row. We can foresee the potential for jamming and mucking around with other musicians if you fancy. As always, there will be plenty of music and chat but in a brilliant (indoor!) setting which has an excellent reputation. There is the outside possiblity of a pint afterwards at the Black Country Arms which is just round the corner. This entry was posted in Dischord and tagged Andrew, Andy, band, Blues, Dischord, gig, guitar, improv, improvisation, jamming, live, live music, music, performance, piano, The Bakehouse, venue, Walsall, Walsall Town Festival on July 19, 2015 by Andrew Clayton. 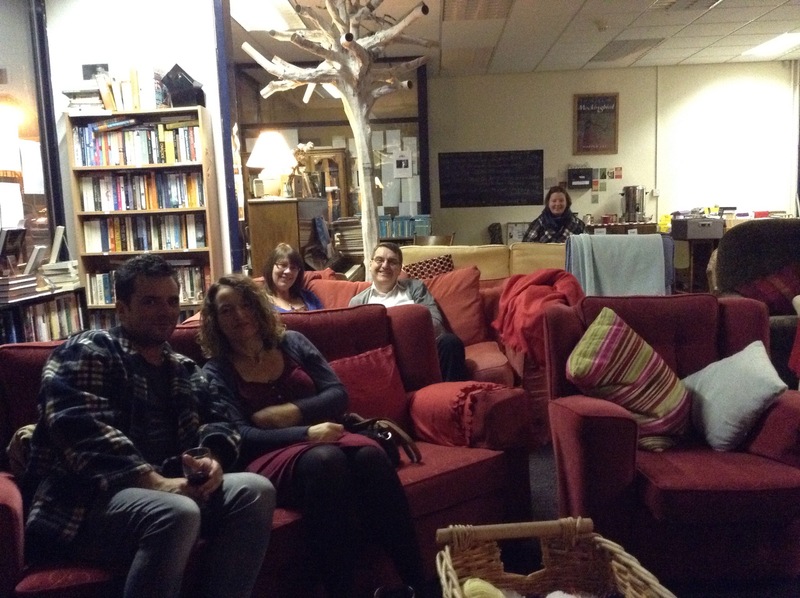 We’ve been to play at The Tree House Bookshop before, and given the opportunity we were delighted to return. Andrew and Andy played our first gig there last year, so armed with our instruments and Dave to the drummer we headed south to find the shop a changed place. This entry was posted in Dischord and tagged Andrew, Andy, band, Blues, bookshop, Dave, Dischord, gig, improv, Kenilworth, live, music, Tree House Bookshop on October 12, 2014 by Andrew Clayton. Thanks to everyone who came to see us in Walsall Arboretum at the Bandstand. It was a great gig and made more fun for all concerned by the two unexpected guests who played and sang with us. The sun shone, we played blues, and hopefully the afternoon was brighter for it. We also want to take the opportunity to thank Gary Nicholson (who booked us) and his team of Rangers at Walsall Arboretum. Gary and Dennis opened up the venue for us, hung around to make sure we got off to a good start, then tidied up and put it all back at the end. Everything they did was with good humour and it was great to work with them. This entry was posted in Dischord and tagged afternoon, Andrew, Andy, bandstand, Blues, Dave, Dischord, gig, improv, improvisation, live, music, performance, Walsall, Walsall Arboretum on July 20, 2014 by Andrew Clayton.